Student housing tours are offered daily as part of campus visits, which are managed by the Office of Admissions. If you’d like to visit student housing, please register for a campus visit. During the student housing tour, visitors are given a presentation with student housing information and are shown rooms in two contemporary residence halls (Residence Hall 3 and Minor Hall) and a room in a traditional residence hall (Deaton Hall). Those rooms are also shown during campus visit events. Due to the number of visitors we have on campus each day, individual student housing tours are not available. Resident rooms in the residential colleges are very similar to the rooms in our contemporary halls. For visitors who wish to view all of the amenities in our residential colleges, tours of Residential College South and Luckyday Residential College are available by appointment. If you’d like to tour one of the residential colleges, please contact the Office of Admissions. 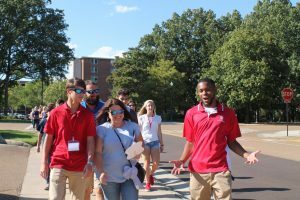 Tours of Campus Walk are available on Monday, Wednesday, and Friday between 12:00pm and 2:00pm or by appointment (campuswalk@olemiss.edu) during fall and spring semesters. Visitors who would like to tour Campus Walk should contact the Office of Admissions. Tours of Northgate Apartments are not available at this time.